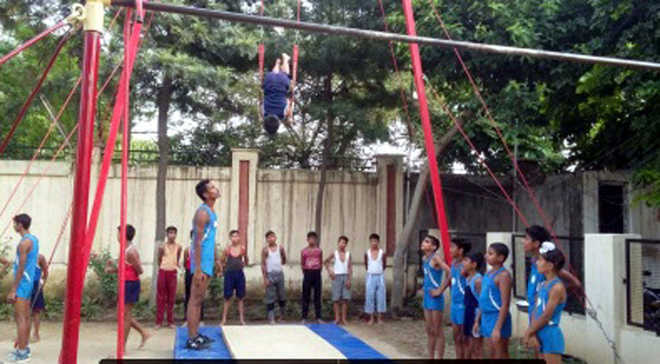 Arjun Shahi and Dailsy were declared best gymnasts among boys and girls, respectively in the competitions organised by the Punjab Sports Department under the Mission Tandarust Punjab at various venues across the district. The U-14 events were held at the Sub Coaching Centre, Khanna. In the boys’ section, Manraj Singh and Maan Singh secured second and third position, respectively while in the girls’ group, Mansi finished as runner-up and Anjali secured third position. In basketball (boys) at the Guru Nanak Stadium, Ludhiana, Satish Chander Dhawan (SCD) Government College, Ludhiana, survived many anxious moments against Ludhiana Basketball Academy (LBA) before romping home victorious 86-81. In athletics at the GHG Khalsa College, Gurusar Sadhar, Coaching Centre, Sadhar quartet emerged winners in the 4 x 400-m relay race for girls while Halwara finished at the second place and Peace Public School, Ferozepur Road, Ludhiana, secured third position. In 200-m race at the Guru Nanak Stadium, Ludhiana, Parasanjit Singh of Civil Lines proved too good for his opponents to win the top spot. The second and third positions were bagged by Inderpreet Singh of Sandhu Nagar and Sahil Kumar of Cheema Colony.